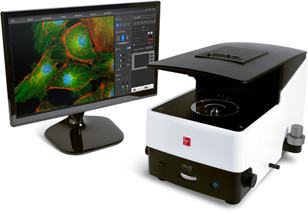 The iRiS™ Digital Cell Imaging System is a multicolor fluorescence imaging system integrated with image analysis software and an onboard computer. With the iRiS™ Digital Cell Imaging System, you can obtain high resolution, publication-quality images without the complex steps necessary with a conventional fluorescence microscope. Bring your digital imaging to a new level with the iRiS™ Digital Cell Imaging System. The iRiS™ Digital Imaging System pairs high performance optics, automation, and a user-friendly workflow to create a seamless user experience. High quality images can be captured consistently regardless of one's level of experience. With the iRiS™ Digital Imaging System, novices, experts, and everyone in between can easily obtain high quality crisp images in seconds. High quality optical components are crucial to acquire high quality cell images. The iRiS™ Digital Imaging System uses the highest quality optical components from Japan. Outstanding image quality has never been simpler. The performance of digital cell imaging is largely dependent on the sensitivity and noise level of digital cameras. The iRiS™ Digital Imaging System is equipped with an ultra low-noise scientific-grade CMOS camera to maximize the signal-to-noise ratio. The iRiS™ Digital Imaging System provides a variety of imaging modes including bright field and phase contrast imaging. Regardless of sample conditions, the iRiS™ Digital Imaging System guarantees exceptional quality in transmitted light imaging. Eliminate the need to transfer images to a separate image analysis platform. The iRiS™ Digital Imaging System is equipped with integrated image analysis software. Capture and analyze your images in real time. The iRiS™ Digital Imaging System offers an extremely simple multicolor fluorescence imaging workflow. Long-lasting LEDs and hard-coated optical filters have been integrated to ensure robust fluorescence imaging. The iRiS™ Digital Cell Imaging System enables time lapse and Z-stack image acquisition with just a few mouse clicks. Complex steps are no longer necessary.